In Jan ’16 verd de gris started work on a major new commission with Super Slow Way – an innovative arts programme shaped by the people of Blackburn with Darwen, Burnley, Hyndburn and Pendle collaborating with local, national and international artists and arts organisations. 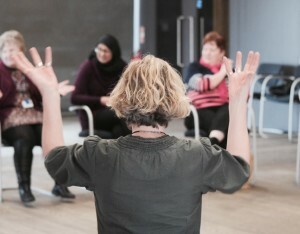 Superslowway is part of Arts Council England’s Creative People & Places programme @CPPnetwork designed to empower communities to take the lead in shaping local arts provision. We were really proud and very excited to be part of this innovative and exciting initiative, which places local people at the centre of decision-making and encourages much greater arts uptake from local communities. We were given the chance to explore some of the issues being dealt with by our carers and volunteers on a day-to-day basis … economic and cultural impact, why people take up volunteering etc. We spent 12 months of creative time with our volunteers – giving them a chance to express themselves, take a creative ‘break’, look at ways of bringing creative activities into their daily activities etc. Our creative involvement was evaluated by University of Central Lancashire (UCLan). This project was supported by Arts Council England and its partners through the Super Slow Way initiative. © 2019 verd de gris All Rights Reserved.